Lots of nice music comes from where it's sunny and people can write songs about surfing and skateboarding and having fun on the beach. Have you ever noticed that? It's carefree and the same colour as the sun, kind of a white-yellow. Which is, like, the happiest ever colour. Cause it's the sun. There just seems to be an atmosphere of fairer weather, tanneder skin and funner lives in music that comes from these areas. Mainly I mean California. Los Angeles (sorry acronym fans) in particular. That's where FIDLAR are from. Yes that's the one, FIDLAR - a four-piece band. What would you call them? Post-punk? Everything's post-punk though, isn't it? What a stupid genre name. My cat is post-punk. My kitchen sink is post-punk. Jesus. 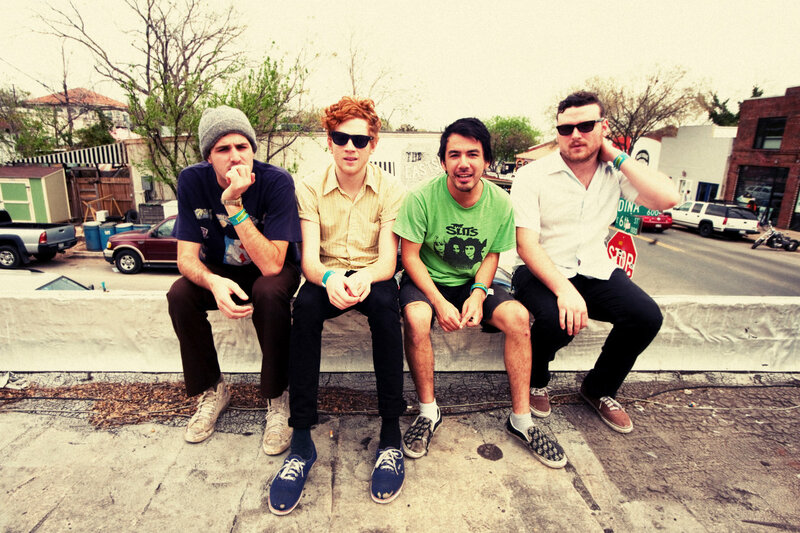 Betcha thinkin' "Whoa all the members of the four-piece FIDLAR look well the same!" But whoa there, don't worry, relax, it's Max, from the band, dressed as everyone else. It's good cause it's the title of the song, but also because it's just one FIDLAR on the roof. References. As for the song itself, ain't it just peachy? What I like most about it is the complete contrast between the rip-roaring shouts of the verse and the relative melodiosity of the sing-song chorus, always with the scratchscreech of the guitars, which sound like they're being battered. The lazy rhythm of the whole song, in fact, and the don't-care-whatever guitar stabs in the verse - and a lyrical treatment of weed - give it this beach bum quality that you can't help but dig undoubtedly. Then there's this, Summer 2012's 'No Waves'. Whew. Fun stuff. At least, the video looks like it was jokes to make. It totally captures the vibes that they seem to be going for. Yeah that's right, vibes captured. Done. Just like a Pokémon. I suppose you could call this the flipside to what I mentioned at the beginning, the not-so-fun side of surfy-beach living. Namely that when there's no fun to be had it isn't fun anymore. Hence 'No Waves' I suppose (no waves no surf). It's very different to 'Max Can't Surf', yet it has all the same elements: jagged guitars, unintelligible serrated vocals and... that's it. A pogo-sticking sugar rush of a song, contrasting the high-velocity-fun-meets-crushing-boredom message of the lyrics (where you can hear them). But I like it. I like it a lot. Their debut album, FIDLAR, is out noooww.